The medieval old town of Girona is just a few minutes drive away, but there is certainly nothing medieval about the PGA Catalunya Resort. This is the jewel in the crown of Spanish golf, a top luxury resort with two championship golf courses and a 5 star hotel tucked away in 300 hectares of prime Catalan forest. I realise this is somewhere special when I spot the roundabout just off the main road; a slick green complete with pin and two bunkers. Quite frankly, anywhere that can put that kind of effort into creating a simple roundabout with a putting surface slicker than my home club greens has to be pretty special. 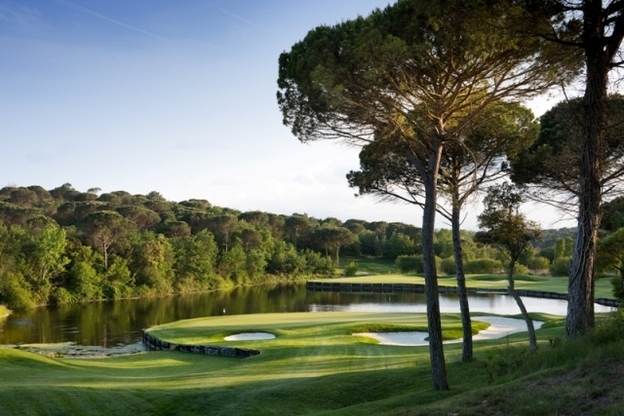 The PGA Catalunya Resort has a fine pedigree dating back 25 years when the area was first mooted as a Formula 1 racetrack. Then, when the prospect of a purpose -built course for Spain’s 1997 Ryder Cup bid was proposed, the racetrack was ditched in favour of a golf course. 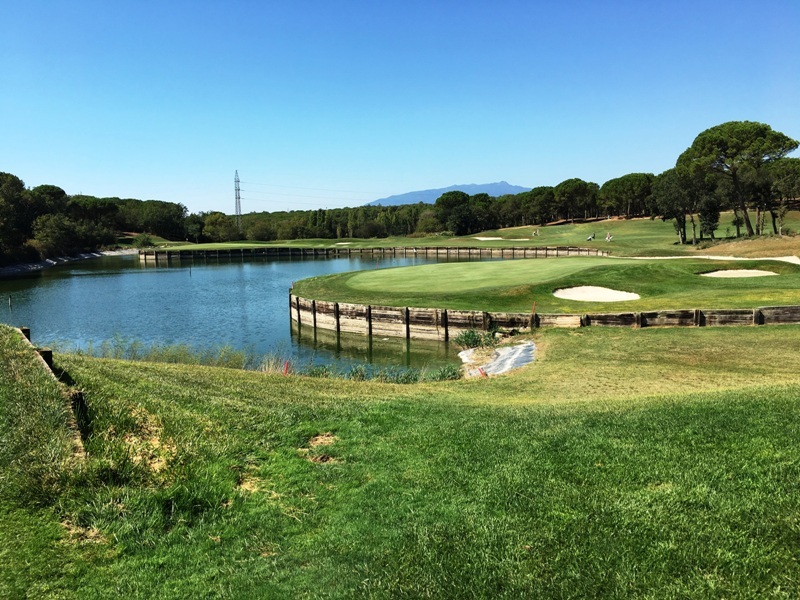 In the end, the development ran out of time and the Ryder Cup went to Valderrama, but Neil Coles and Angel Gallardo’s course design finally opened in 1999 as the Stadium Course and PGA Catalunya Resort was off and running. After The Tour Course was added six years later, Irish telecoms billionaire Denis O’Brien bought the property in 2008 forming a duo of top luxury golf destinations with Quinta Do Lago in Portugal’s Algarve. 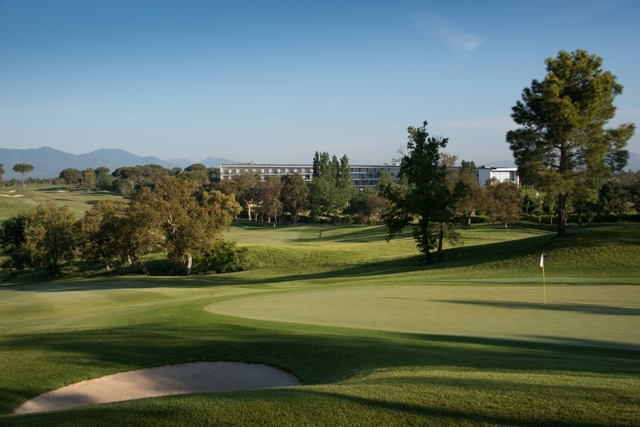 O’Brien sunk significant investment into PGA Catalunya allowing the resort to expand its potential. The hotel, now called Camiral was upgraded to 5 star status and joined the Leading Hotels of the World portfolio. Sergio Garcia opened his first Junior Golf Academy, putting and short game coach Dave Pelz established his Spanish Golf School. O’Brien’s long game is always in real estate, and just like at Quinta do Lago a discreet plan of luxury property development is in action. There is no doubting O’Brien’s influence here as I tour the 5 star Camiral Hotel sitting proudly alongside the Tour Course 5th fairway. It’s a major step up from its former life as a Melia property with some heavy duty luxury furnishings and a emphasis on high end Catalan cuisine. 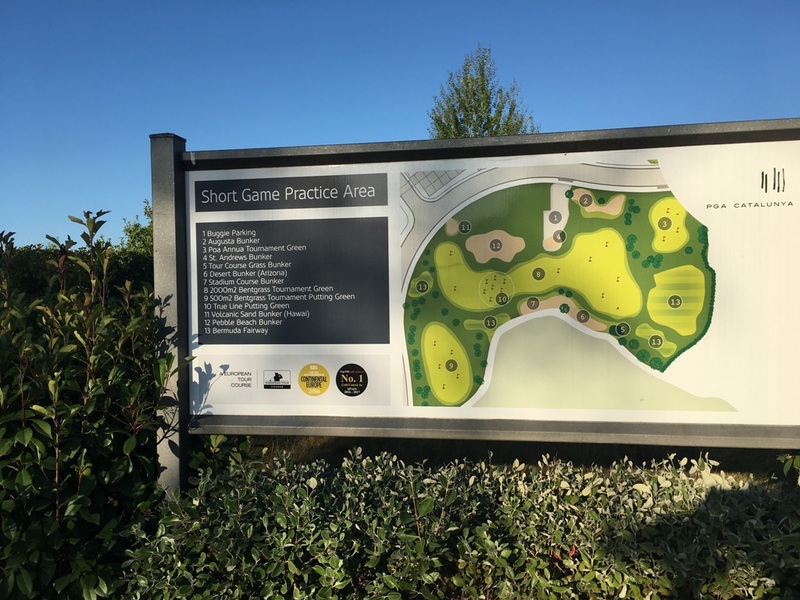 It’s just a short walk to the clubhouse, although The Camiral offers a buggy shuttle if you want to avoid walking on a hot day. I stroll past the practice area and spot something else a little bit special here; five bunkers that replicate the sand conditions found at Augusta, St Andrews, Pebble Beach, here on the Stadium Course and one featuring Hawaiian volcanic ash! 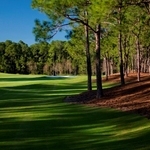 The Stadium Course awaits and although I don’t admit it, a course that stretches over 7,300 yards par 72 off the back tees, with large dollops of water affecting no less than seven of the toughest holes is going to be a mighty challenge for anyone. It doesn’t disappoint, even though I swallow my pride and play off the yellow tees. There are some spectacular holes here. Sweeping undulating fairways between lines of pine, cork and oak trees, bunkers everywhere, elevated tees and lightening fast greens with one or two of them practically islands it not for a narrow strip of land. The long par 3 5th has water lurking on the left and bunkers on the right. The 9th is a long par 4 and the toughest on the course. Bunkers and rough everywhere. The short but dramatic 11th is a par 3 almost surrounded by water, so I take a deep breath, hit and hope. The signature 13th is very memorable. 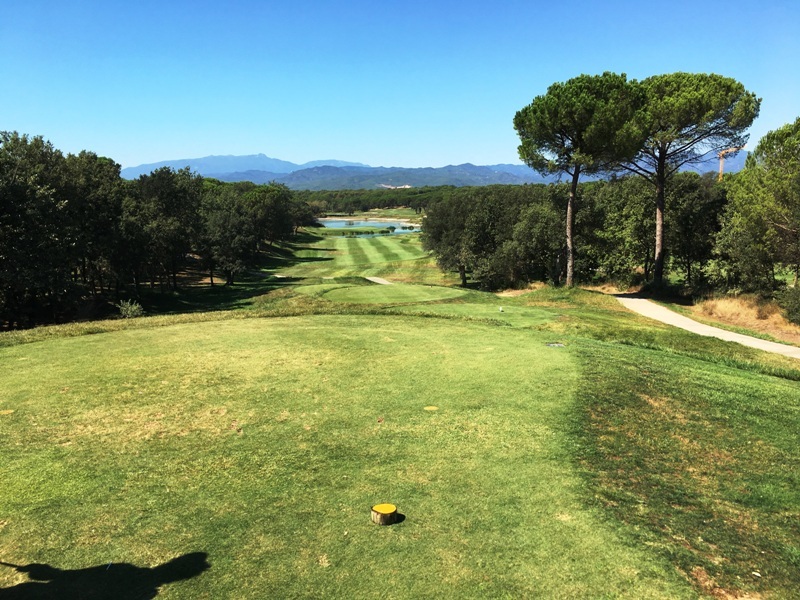 Downhill drive with the majestic Pyrenees mountains as a backdrop and a huge second over what looks from the fairway, as nothing but a sliver of green. I play it as a par 5 and get lucky with a par. At the end I feel I’ve been in a real tussle and lost. The Stadium Course is a daunting challenge but a thoroughly enjoyable one. I drown my sorrows back in the welcoming arms of Hotel Camiral and dream of lakes, bunkers and trees. I take on the challenge of the Tour Course in a more positive mood, after all, this should be a doddle after the Stadium. It is shorter, at 6,560 yards with wider fairways and a lot less penal, but still with enough water to keep me on my toes. The front nine offers me hope of a good score with a few pars but the back nine’s elevation and water soon changes that positive outlook. The 12th is a little daunting, a drive that has to carry the water but not too big as bunkers await to catch an over eager drive. The 15th par 5 stretches moon-like around a lake mightily tempting for a big hitter to go for it in two. I narrowly miss a birdie at the par 3 15th, but it’s still satisfying with the green guarded by water. I finish the Tour Course in a much better mood. It is an excellent resort course and perhaps the poorer sibling to the Stadium track. Yet it is used by the PGA European Tour Qualifying School so it’s certainly no pushover. 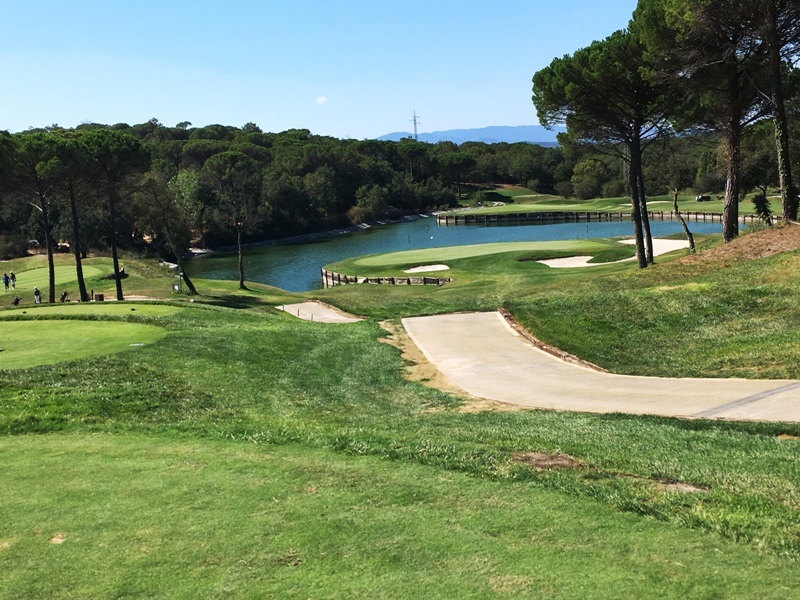 PGA Catalunya fully deserves its lofty status as Spain’s best golf resort and with talk of another hotel to be constructed specifically for golfing groups, there is clearly a lot of forward thinking going on. As for me, after my Stadium Course performance, I think I’ll stick to the roundabout green next time. 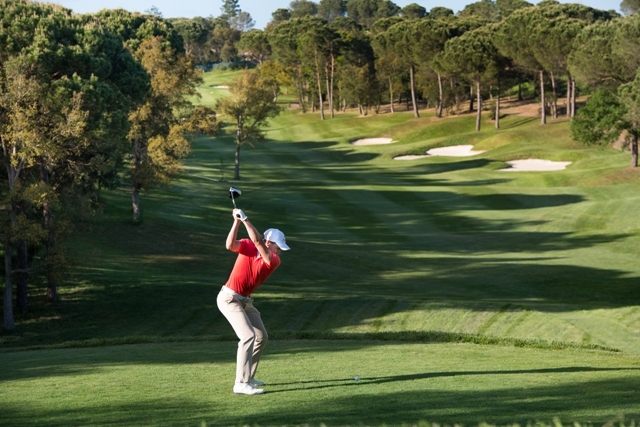 PGA Catalunya Resort is just a 10 minute drive from Girona Airport. 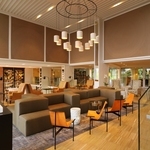 PGA Catalunya Resort, N-II km 701,17455 Caldes de Malavella, Girona, Spain. Golf rates: Stadium Course from €82 Tour Course from €72. Rates vary according to season and time of day.